Wedding Reception Venue & Hall in Salem & Plaistow, NH | "DiBurros"
The ceremony site will vary from a church, hotel, club, or private home. If you decide to have wedding bands Jacksonville, D.J., Pianist or Sax Player you should contact your choice a year in advance. This will also be your Emcee and he/she will need appropriate information. Photographers are usually booked a long time in advance so make sure you look for good wedding photographers Cleveland. This is becoming more and more popular as a keepsake. Even if you don’t have a video recorder now, you may in the future. When planning for a cruise or specific location, reservations may be necessary a year in advance. Once your engagement is announced, people will need to know your choices. 6 months may be enough time unless you are getting married during the spring or summer season or when getting a specialty car. 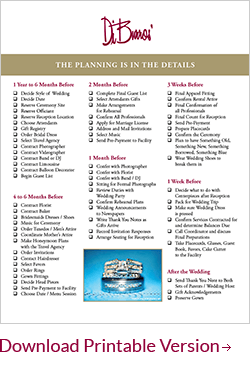 Discuss with the officiant the details of your ceremony. Be sure to bring up the topics below. It will be easier if you and your fiancé discuss these after asking what is permitted at your ceremony location. You can then plan with your florist, photographer, videographer, musicians and family. Check with the Photographer for the time of arrival for taking pictures at your home to be sure you’ll have enough time to prepare for your Wedding Look. Make an appointment with the Hair Salon, Makeup Consultant, Finger Nail Consultant. A trial run will make a world of difference in the confidence that you’ll have on your day. It will also affect your wedding pictures knowing if your makeup and hair is perfect. Since the wedding pictures often show your rings, you’ll want your nails to look their best. Wine or Champagne is the classic beverage for toasts. Usually the formal toasts begin before the food is served. The best man traditionally made the first salute to the bride; today it’s often to the couple. The customary toast has two parts: a reference to the toaster’s relationship to the couple and a wish for their future happiness. You don’t drink when you’re being toasted. Occasionally the groom will give thanks to his best man and a toast to you, to his parents, and to his new in-laws. Perhaps you’ll want to be next with your own affectionate words for him and your parents. Other members of the wedding party can then propose any toast they wish. After the toasts, your best man can read congratulatory telegrams from distant friends and relatives. Wedding toasts are heartfelt and usually easy to compose. If you run into writer’s block, consult your local librarian for sources. Plan your first dance when you sense it would be right. Alert your guests with a drum roll or have the Master of Ceremonies make the announcement that the newlyweds are about to twirl around the floor. As a rule, you dance with your father next and the groom with his mother. The best man is your next partner; the maid/matron of honor your groom’s. Then it’s the new in-laws turn – you with his father and he with your mother. This order is customary but optional. In fact, if family interrelationships are very complicated, you might have your first dance and then open the floor to all. You can’t expect to unravel intricate webs in one extraordinary day. After the tensions of the day, your reception is relaxation time. By all means, have a wonderful time dancing the night away but watch out for your beautiful gown. Dancing without shoes might mean ripping your dress. Cutting the cake together is another reminder of your pledge to share life. Elaborate wedding cakes are often featured on their own skirted table and cut with a silver cake knife decorated for the occasion. Have your M.C. announce the event, join hands with your groom and together cut the first slice. Offer one another a nibble – it makes a great wedding album shot. Suggestion: Serve your wedding cake with ice cream for dessert. The great celebration is drawing to a close. You’ll want to gather your forces for the last traditional rituals: tossing the bouquet and your blue satin garter. Decide in advance whether you or your groom will remove the garter. This is not time for any disagreement. Say good-bye to your family and friends and exit happily. When you two look back on the day, you’ll remember that your wedding had a special glow and a meaning no other day will match.